If we want to help people, like our colleagues and leaders, to understand why performance measurement needs to be done better, we need to engage them in the right kind of dialogue. Many of our colleagues and managers feel cynical about performance measurement because of their bad past experiences and current struggles. So we often need to reinvigorate the support from our colleagues before we can get the training, systems, or resources that we know we need for meaningful performance measurement. 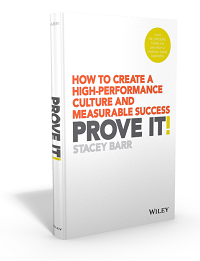 We need to give our colleagues new hope, a promise that there is an easier and more meaningful way to measure performance, and that doing so will truly transform the organisation. The PuMP Mind Map exercise is an engaging way to help people better understand performance measurement. The PuMP Mind Map is an exercise I have used many times to warm up executive and operational teams to a fresh and exciting approach to meaningfully measure what matters. This is a quick and easy exercise to do, and people seem to love its cathartic effect. If we want to reignite hope in meaningful performance measurement, the PuMP Mind Map exercise is a great starting point. Before using the Mind Map exercise we need to decide who we want to influence and therefore who we should invite to do the exercise. The exercise takes between 30 minutes and one hour. It’s ideal to do the activity during a time slot set aside within an existing meeting, preferably one that has to do with planning, goal setting, or performance monitoring, so that the people who attend will be focused on the issue of performance measurement. We’ll need a whiteboard, or, if we have mind-mapping software, we can use a computer and data projector. We should make it clear to those attending that this is not a presentation but an interactive activity. As we would start any meeting, we kick off the PuMP Mind Map exercise with a brief explanation of its purpose. For example: ‘I invited you to join me today to explore a completely different way to develop meaningful performance measures that solves a lot of the problems we’ve had in the past’. The purpose we express should be one that resonates with our colleagues, so we should choose our words deliberately. On a flipchart sheet or a whiteboard, we draw the centre of our PuMP Mind Map, along with eight branches numbered 1 to 8. These eight branches each relate to one of the eight steps in the PuMP Blueprint. But we don’t want to introduce PuMP in any way just yet (although we might want to have a ‘cheat sheet’ diagram in our notes with the eight branches labelled, to remind ourselves; we’ll discuss this in just a minute). At the beginning, the discussion should be all about our colleagues’ experiences and feelings with performance measurement. They need to feel the pain before they can be open to a solution. And they need to see the patterns in their pain, so they can see the relevance of the solution. What frustrates you about measuring performance? What challenges are you experiencing with measuring performance? Why do people avoid performance measurement activities? Why aren’t we getting great value from our performance measures? As each person shares a problem, write it immediately on the Mind Map at the number (PuMP Blueprint Step) to which it most relates. This is where our cheat sheet comes in; we can refer to it if needed, to jog our memory about what the eight steps are and where we might place the issues that our colleagues list. We just do our best, and we don’t worry about perfect allocation of problems to PuMP steps; close enough is good enough. We can also put something on two branches if we can’t decide where it goes. We need to use the exact language that our colleagues use when they articulate the problems. We don’t try to summarise, rephrase, or make their comments more brief. We’ll lose the emotion and personality if we do, and we might even make our colleagues uneasy that we are altering their words to achieve a particular goal. If someone expresses a long complaint, we ask him or her to help us boil it down to a few words so we get it just right. Now’s the time to introduce the PuMP Blueprint: we explain its eight steps, what they involve and why they are important. Each step is designed to overcome the majority of struggles people have with performance measurement, which are the very struggles that our colleagues just mind-mapped. As part of debriefing, we explain that, in addition to Step 4, the social side of performance measurement (e.g., politics, buy-in, learning) is managed through each of the remaining eight steps as well. PuMP has become well-known for the amount of buy-in it creates from even the most cynical members of an organisation. We also explain how the PuMP Blueprint is a framework for a team-based approach to performance measurement, and that it’s supported with clear instructions and practical templates that are easy to follow and that work every time. Then, we ask for feedback and comments. Our approach to this entire exercise, including receiving feedback at this point, should be a feeling of ‘holding the space’ for our colleagues to talk about measurement in an honest and open and different way. We do whatever we can to encourage that. What kinds of struggles would they see vanish? What qualities would their new performance measures have? What impact would a new approach to measurement have on executing strategy, reaching goals and hitting targets? What would new measures mean for the mission and vision of the organisation? The ideal outcome of the PuMP Mind Map exercise is a decision to pilot-test PuMP somewhere in the organisation, with support from management to monitor the pilot and evaluate its success after the eight steps are complete. Who would you involve in a PuMP Mind Map exercise, to increase the energy to take a better approach to performance measurement? Invite them to do this exercise with you. Just wanted to say thank you for sharing this process and for sharing all of your experiences. Congratulations on having the BSI teaching your PumP methodology. Now if I could only get my executives take the class. I do love sharing things I’ve found useful, and I love even more when people like you let me know you find it useful! If you want a bit more info about getting executives engaged in performance measurement, shoot me a quick email and I’ll link you to some more tips on that. Sounds great, Maryanne. Performance measurement is a process like any other business process. So if we want to improve something, we get great insights by looking at HOW we do it, which of course is described as a process! Very interesting article, as always. I work with clinical staff who also teach and have a lot of challenge fo their time. I would like to be able to present something that inspires them to engage with performance measures and will try the Mind mapping idea, to hopefully engage and then inspire them. Great Beverley! It really is an interactive and acknowledging way to start the right conversations about measurement. Please do let me know how it goes. Wow. I never knew about this PumP methodology and this article has brought new insights into the subject of performance measurement. I will have to use learnings from this method to develop a measurement framework for my organisation to guide in development of KPIs, because at the moment there is no process followed it is gues work based on previous KPIs. Stacey maybe you cab provide more information on how i can go about it. Thanks Gaolape for sharing your thoughts about this! Please feel welcomed to contact me personally, for more information about how you can develop a measurement framework with PuMP. I would like to understand more before I offer you any advice about options. Please contact me at info@staceybarr.com.